To the surprise of no-one, Apple unveiled a brand new device yesterday: the iPhone SE. The 4 inch handset was one of the worst kept secrets in the tech world, with rumours more or less confirming every feature before Tim Cook uttered a single word. Still, there’s plenty to get excited about: it’s a smaller iPhone that doesn’t compromise on performance, making it the most powerful 4-inch phone ever. 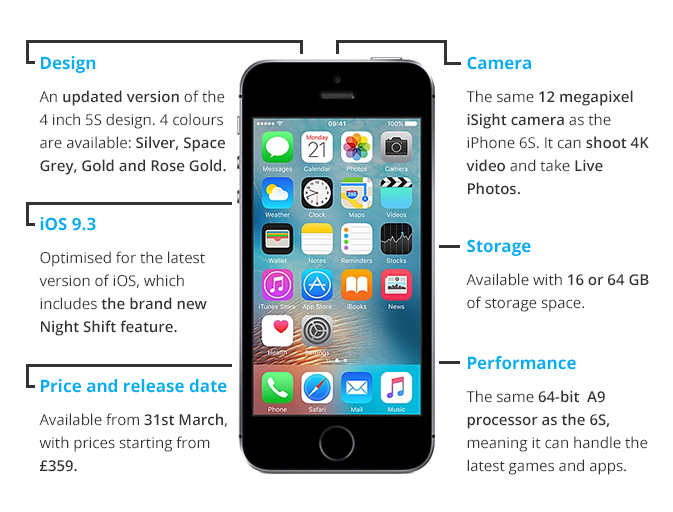 Here’s everything you need to know about the iPhone SE (which stands for Special Edition) at a glance. As previously mentioned, the iPhone SE is the most powerful 4 inch phone ever. Even though there are a lot of Android devices available in a similar size, they’re often the ‘budget’ option. The SE has more or less the same specs as Apple’s flagship device in a smaller build. Apple clearly got their hands on a shrink ray, because the new version of the iPad Pro is smaller too. The new device measures just 9.7 inches, a significant drop from the 12.9” device unveiled last year. The size difference hasn’t affected performance though, with a super powerful A9X chip providing all the power you need for intensive task and multitasking. It’s ideal for creatives and professionals who need a little bit more power from their tablet. Other features include a brand new display, which Apple boasted has the lowest reflectively of any tablet on the market, and a 12 megapixel camera. Due to the smaller build, the camera now protrudes from the back of the device like the iPhone 6. If you’re planning to upgrade to the iPhone SE, sell your mobile phone now and lock in the price for 28 days! Simply get an instant price, send your items for FREE and we’ll pay you the same day your items arrive.